Binn Bhán means 'white peak' and is the highest mountain in Galway. You could say it is the Mont Blanc of Connemara. There is a lot of white rock here, mainly quartz, though this is more a feature of Benbrack. An odd thing about the Twelve Bens of Connemara is that nobody seems to know exactly which are the twelve peaks in question. There are at least 20 peaks with names in binn in this area. However, the notion of twelve peaks goes back at least to the time of Roderic O'Flaherty, who wrote in 1684 of the twelve high mountaines of Bennabeola, though he did not enumerate them (O'Flaherty, 106). In Irish the question doesn't even arise: there is no number, they are just na Beanna Beola, 'the peaks of Beola'. Beola was a giant and chieftain of the Fir Bolg, whose name also features in the village Tuaim Beola (Toombeola). 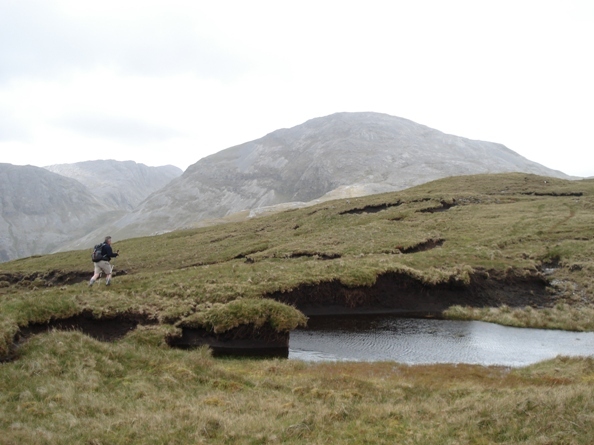 Binn Bhán is the highest mountain in the Twelve Bens area and the 90th highest in Ireland. Binn Bhán is the highest point in county Galway. Climbed Ben Baun and Ben Free on June 15th 2011. From Kylemore Lough take right on the R344 towards Lough Inagh. Right after the woods, take the first small road right to Glencorbet (not indicated, only 5 houses). There's space for about 5 cars on your right hand side after the bridge and before the first stable. Once you're up the ridge, turn right and find your way through the peaty labyrinth towards the white rock of Ben Baun. Then straight up the white rock without any danger towards the windy top. When you have little time but enough to do a small extra, go down to the west into the saddle between Ben Baun and Ben Free and hop up Ben Free in 10 minutes. Back down into the saddle and downhill to the river at Glencorbet Farm. Be careful when descending from the saddle : before traversing to the right be sure you are deep enough to pass below the vertical rocks at the West face of Ben Baun.